Mr. Billy Dean Galloway, age 87, of Milford, Ohio, passed away Saturday, April 6, 2019, at the VA Medical Center in Cincinnati. Mr. Galloway was born October 25, 1931, in Red Bird, Clay County, Kentucky, to the union of Jewell Lewis Galloway and Juanita Reynolds Galloway. He was a Veteran of the United States Army, having served in Korea 1948 – 1952. 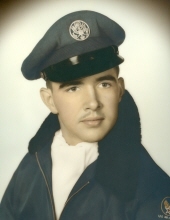 He also served in the United States Air Force 1954 – 1957. Mr. Galloway was retired from Continental Can Company in Cincinnati, where he was employed for 30 years. He enjoyed riding motorcycles for most of his life. He loved his family and was proud of all of his children, grandchildren, and great-grandchildren. Billy Dean Galloway is survived by his wife of 60 years, Annetta Stover Galloway of Milford, Ohio, and by the following children: Kimberly Galloway Tomberlin and husband Drew of Clarkston, Georgia; Lynn Galloway Ashley and husband John of Chattanooga, Tennessee; Gail Galloway of Cincinnati, Ohio; Deana Schneider and husband Steve of Glendale, Ohio; and Barry Galloway and wife Karen of Defiance, Missouri. Mr. Galloway is also survived by the following grandchildren: Colin Fitzgerrel and wife Alicia, Kyle Fitzgerrel and wife Rosie, Kelsey Fitzgerrel and wife Lauren, Arron Gray and wife Katie, Alex Gray, Cory Sutter, Ty Sutter, Samantha Grandon and husband Christian, Dane Galloway, and Max Galloway. He is also survived by the following great-grandchildren: Nolan Fitzgerrel, Warner Fitzgerrel, Lydia Gray, Pax Fitzgerrel, Watson Fitzgerrel, and Lyra Grandon. Mr. Galloway is survived by one nephew, Fred Galloway, and by two nieces, Carla Galloway and Renee Galloway. He was preceded in death by the following family members: his parents, Jewell Lewis Galloway and Juanita Reynolds Galloway; his sister, Betty Jean Galloway; his brother, Carl Galloway; his daughter, Billie Galloway Gray; and his grandson, Zachary Sutter. Funeral services for Mr. Billy Dean Galloway will be held on Wednesday, April 10, 2019, at 11:00 AM at Grace Baptist Church 1004 Main St. Milford, Ohio 45150. Friends may call at the church beginning at 10:00 AM. Interment will follow at Evergreen Cemetery. In lieu of flowers, memorial donations may be made to Grace Baptist Church. Courtesy announcement Evans Funeral Home is in charge of arrangements. To send flowers or a remembrance gift to the family of Billy D. Galloway, please visit our Tribute Store. "Email Address" would like to share the life celebration of Billy D. Galloway. Click on the "link" to go to share a favorite memory or leave a condolence message for the family.